For me time not on the bank is filled with prearation, making boilies, rigs etc – always being prepared before getting to the bank is very important. At the moment I am messing around with hook baits, buoyancy, colour and flavour. Slight changes in these can make a big difference so many hours spent in the shed are the norm. With work being very busy of late my fishing time is minimal, so a recent batch of pop ups were sent to two of my mates to take to their lakes. One reported back with 7 takes – 4 making it to the bank with the best being a 34lb mirror Carp. The other batch went to my mate, Dave to have a try on his syndicate lake which I was about to spend a weekend at as a guest. He reported a 7 fish catch with the best being 28lb. Running a small electrical company and with family life, my fishing is fitted in wherever possible. When the rivers opened I was back on the bank trying to catch a Carp from my local stretch. The spot I was fishing has 5 miles each side to the nearest lock so many hours of waiting is the norm. After a blank night I reeled in to find the hook bait was missing on all 3 rods! With time for a bite I re-baited, clipped the rods up and cast back to the spots I had baited. Winding in at the end of the session to find my hook bait missing again – they had only been in the water for an hour! The rig had been crimped by Cray claws. So a trip to the shed was in order making some super hard hook baits ready for the next trip. With only time for a few hours fishing in the evenings I tend to swap the Carp rods for specimen rods and go after Barbel. At the moment I’m using worm boilies and paste with some good results. As everyone else seems to be using meat, so far my best is 10lb 12oz and a few good Chub to 6lb – a small change but one that has paid off. Every year I take a week long holiday to France at Easter. Arriving at the lake this year we were met by the owner. He walked us round the lake saying how the fish loved fruit type boilies. Unfortunately I only had fish meal baits with me. While I was getting my particle mixed in a bucket a can of sweet corn was emptied in to the mix. Sorting through finding the biggest for hook and dropping them into some fruit flavour – a plan was coming together as 2 grains of corn were put onto the rig and cast out with a small bag of the mix. While I was getting the next rod ready the first was away. Under an hour and a fish at 33lb – happy days. With that rod put back on the spot for the night, my second bite alarm burst into life and a spirited 26lb mirror was on the bank. Good old corn. 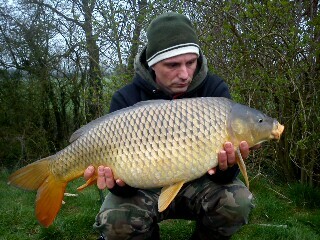 Anyway I ended up with 12 fish to 52lb which was a brace with a 44lb common. I didn’t even use one boilie in the end, a little thing that caught me some good fish. With my van now full of tackle it was time for a session with my pal, Dave at his lake with some of the hook baits and pop ups that he had used the week before, surly it was only a matter of time! After getting set up and a good look over the swim with the marker rod 3 spots were baited up. Time to chill and catch up with Dave who had been at the lake since Tuesday. After an uneventful night the day passed quickly and at 3pm my margin rod was away. The fight was cut short by a cut off on a mussel. Not what you want so to the tackle bag for some mussel braid from PB products and 5 rod lengths of the braid and a new rig were put back in the spot. 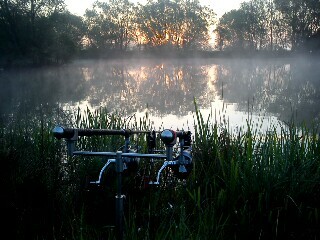 The second night was as the first but at 3.30 am my long rod was away and then stopped dead. Wellies on and wound down to nothing, I had been cut off again. Re-rigging and casting back to the spot still hopeful. Nothing further happened, but at least I was fishing. With the school holidays upon us I took my daughter, Felicity to her favourite place to fish, Drayton in Daventry where we will be fishing off the dam wall. 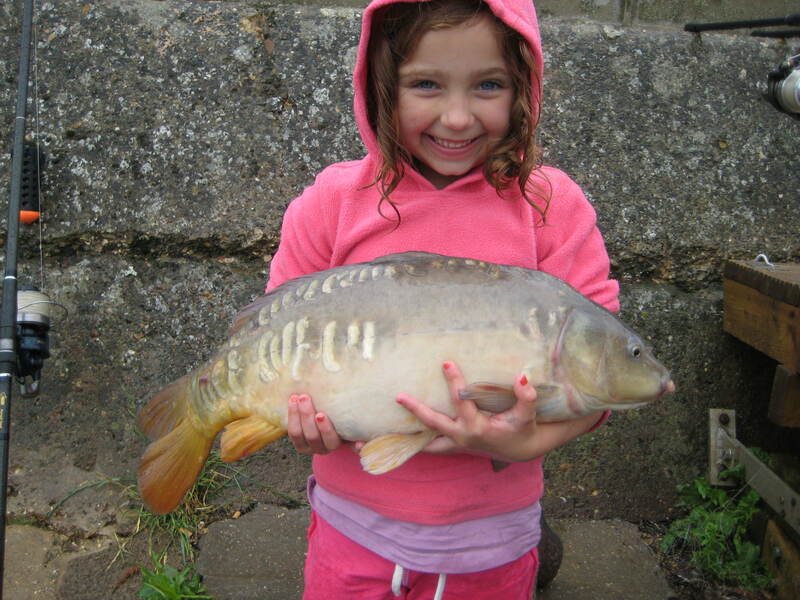 On our last trip she had 19 Carp to 18lbs – not bad for 4 hours fishing by a 7 year old. Once again on this occasion we had turned up with our usual bait and it was going slow, so we swapped to barrel shaped hook bait with a small bag of crushed boilie. With the spod working overtime (my part in the session), the new bait was away, followed by the second rod 2 on at once, so I had to lend a hand. More spod mix out and recast both rods, keeping a steady flow of mix going in. The bites coming straight after the spod had made contact. This whole episode was in a torrential rain, and Felicity was in her usual pink outfit, just because it’s fishing she still wants to look good. To be honest I’ve not had the best time with my own fishing, all be it nothing to do with what I’m doing more circumstances surrounding my time spent fishing. For instance I have spent 10 nights on a lake with no Carp left in it onl being told when it was too late. Still my time on the lake was nice, time to catch up with some sleep and it made me work that little bit harder. I did manage some nice Tench and a few Bream but just being there on my own (funny that) watching the Kingfisher and getting right into nature, with great big Grass Snakes trying to make a nest in my unused landing net. I see the funny side now but it was getting a bit frustrating. I don’t think there is a better place to wake up, with morning mist rising from the water, better than that I had the place to myself. I’m now on the lookout for a new water with fish in it and maybe a few other anglers as well. This week I’m back down to the river armed with my Greys Prodigy TX Barbel rod, hopefully winding in some bars of gold. As I’ve said along the way ‘It’s the small changes’ that can make the biggest differences. Just try fishing swims that don’t get fished, move away from other anglers on a busy day. Try and do little things to keep ahead of the competition and also the fish. Enjoy all the little things going on around you as they may well piece together the bigger picture and help to catch. Making sure that ever thing you can see and do is done as the rest of the game will take place out of sight. Make sure you are all set and ready for whatever happens, with a few options in your tackle box. Before I sign off I have a little story I’d like to tell you about myself. While I have been fishing the river for Carp I have been putting my shelter up in amongst the long grass and, as it turns out the pollen sends me a bit funny. Anyhow I’ve ended up sleep walking down the tow path to where my van is parked, then walking back to my profile, taking off my shoes and standing on the wet grass. It was at this point I woke up a little bemused. I mentioned it to the lads and they are in the process of getting me a goat spike and enough rope to get to the rods, to prevent another late night walk about. This entry was posted in Profiles and Angling Stories and tagged carp fishing, simon firth. Bookmark the permalink.